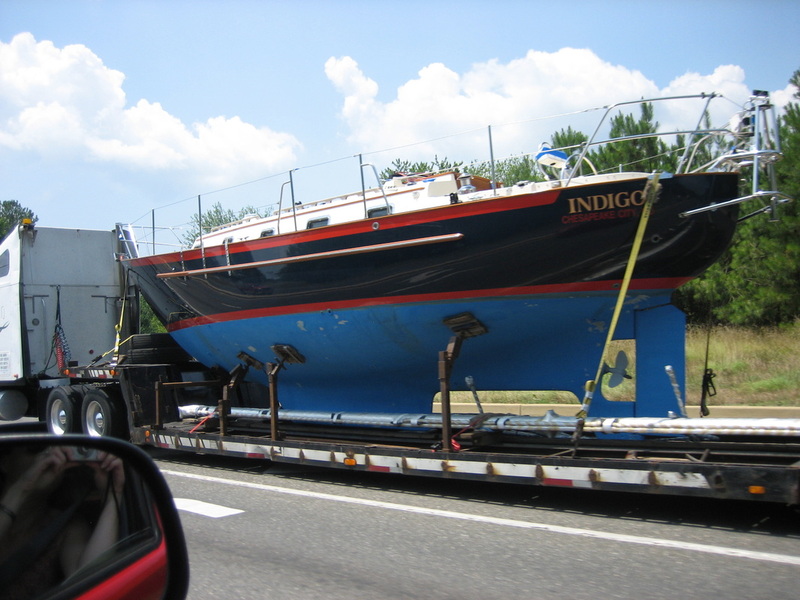 How on earth does a normal person (a) decide a boat is worth the money and effort to ship it across country and (b) actually get it shipped? In early 2010, we tried everything in our limited power to stay stationed on the east coast, anywhere, VA, MD, NC even NJ or GA for reserve billets... nothing. We were destined to go back to Cali. 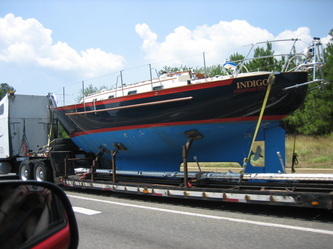 For awhile we thought about putting Indigo on the hard for a couple years. If Brian took two year orders we could try and get back there for his last two years. Not ideal, but we didn't think we'd be able to find a slip, at least not close by or cheaply enough. Oceanside, CA is notorious for it's slip waiting list, extorting yearly dues ($150 currently). We were on their list with Adagio, as well as Camp Pendleton's list, and didn't move in 4 years. Getting a slip at Camp Pendleton was the clincher. It was a fluke call... the marina manager, our former sailing instructor, just happened to have a slip available. Hallelujah! Question (a) was decided. Question (b) became harder to answer. I asked our boat broker as well as Pacific Seacraft for some recommendations. Ultimately it came down to Lewis Specialized Transport. They had a reasonable price and I was able to schedule a pickup date within a time-frame of two days; they were there the first day, on time. Logistics was the easy part, packing was another story. If I remember correctly we were quoted approx $2000 to pack the boat. So we opted for the DIY method. 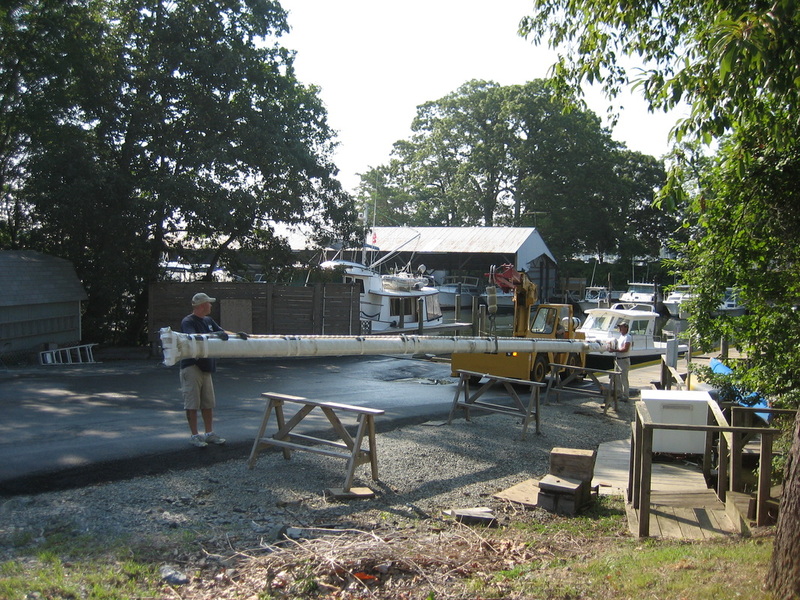 While we needed a crane to unstep the mast, we packed the mast and boom ourselves. Don't think this is an easy or a quick task. It took two weeks, Brian full time and me part time; and I realized why the quote was that high. As long as you have the time, we recommend it - you will probably do a much better job than anyone else. The boom was easy, wrap the crap out of it with packing blankets and shrinkwrap and duct tape. Harbor Freight has cheap but good packing blankets. We were told to put as much as we possibly could inside the boat as low as possible. Every single bath towel and washcloth I owned was re-purposed for packing boat gear. Each piece of equipment inside each locker, from the teakettle to the Dramamine, were wrapped, duct taped and stuffed to the brim so nothing would move, shift or rub. 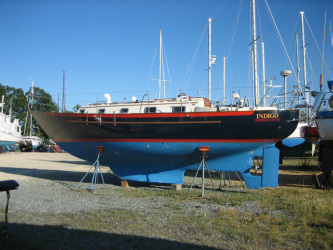 The dinghy motor was emptied and wrapped and laid on top of packing blankets and sails, sail battens, ladder, dinghy, tools, bimini, dodger windows, etc., all carefully positioned on the cabin sole so nothing would shift. The mast was the most difficult. Of course roller furling cannot and should not bend. But laid out, the furlers were longer than the mast by several feet. 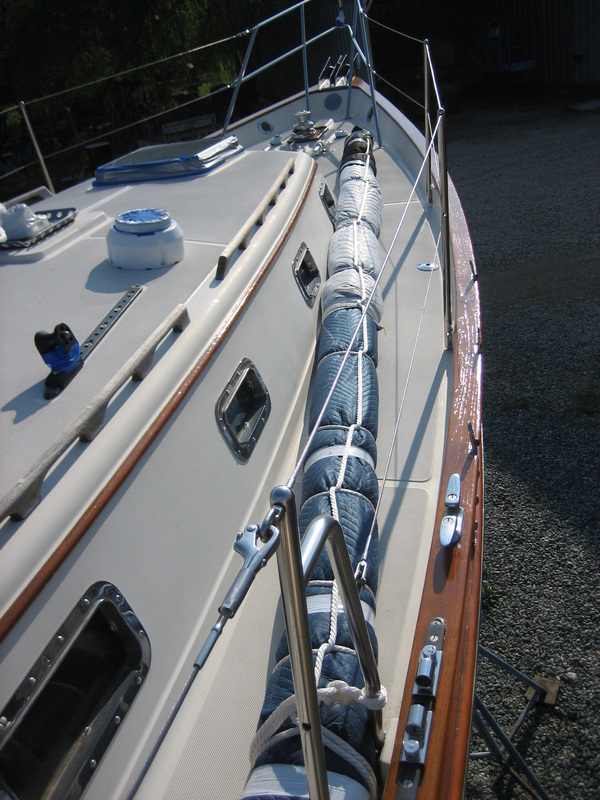 Brian came up with the idea of putting a couple pieces of wood inside the masthead, sticking out far enough to be able to wrap the furlers to it, essentially extending the mast to the longest furler length to keep them straight. It worked great. 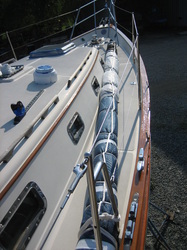 We wrapped the furlers and rigging separately to keep them from scratching the mast. It needed painting badly anyway so we weren't too worried about it as we decided we would get it painted once we arrived in CA. 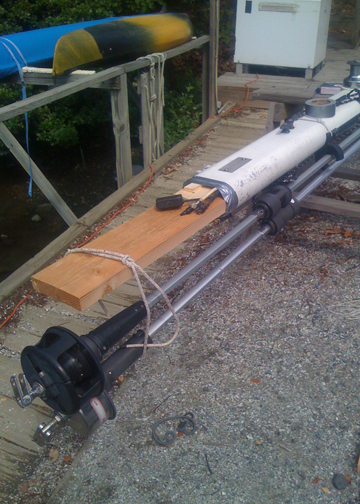 More bubble wrap, shrink wrap and duck tape later, the mast was complete. Mast and boom were secured beside the boat on the truck bed cushioned by a bunch of carpet remnants under the mast to prevent rubbing, along with wrapped bimini arches that won't fit inside the boat. 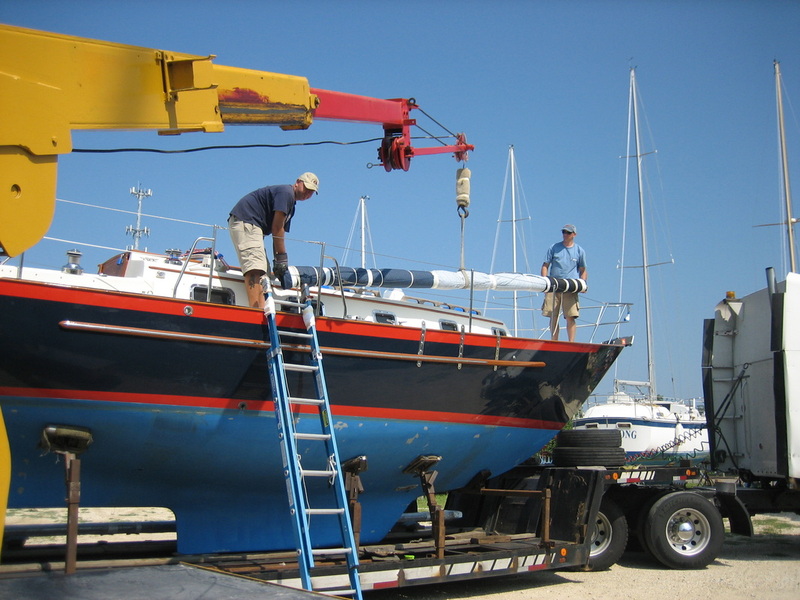 The advice we received from the guys at Spring Cove Marina and Lewis Transport for securing the mast, boom and internal items, helped tremendously. We were extremely happy with Lewis Transport. Camille was super helpful with answering my questions via email, directing the wire transfers and paperwork. Dave, our driver, called us every day so we knew where he was, and that the boat was fine. We did not follow him. 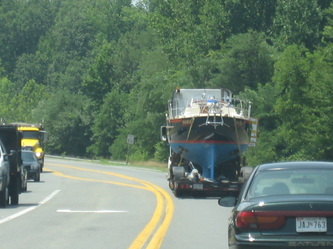 We were driving two separate vehicles ourselves, trucks have to take certain routes with a load like that and we didn't want to follow that route, plus we drove to Georgia for an extra couple days to see Brian's dad. The rest of the time we played catchup. It took him about a week to get there. After leaving Yuma in 115deg heat at 4am, we raced across the desert mountains to make it in time for the off-loading at 9am and there was not a scratch on the boat. I highly recommend them. But I hope I never have to do it again. Boom wrapped on deck - we later put it on the truck. Mast wrapping complete. Moving it to the boat via crane. 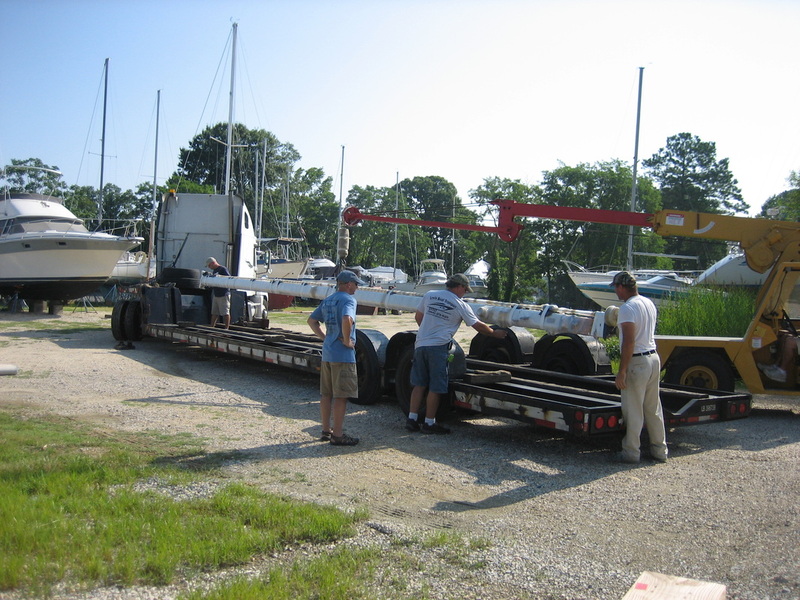 Wrapped mast headed for truck. Adding the mast to the truck bed. 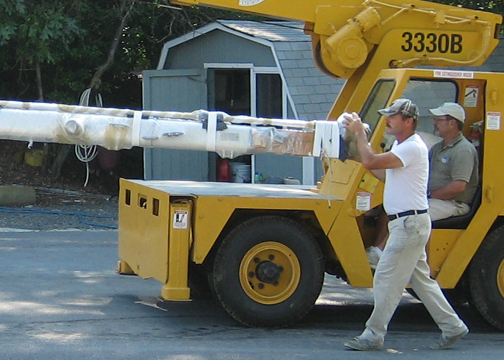 Moving the boom to the truck bed. Driving behind our boat. Terrifying. One last glimpse before we turn to go home and pack the rest of our house.